NASA has confirmed the Nuclear Spectroscopic Telescope Array (NuSTAR) X-Ray telescope has successfully made it into orbit after an airborne launch over the Pacific Ocean. NuSTAR was launched at 9am Pacific Time in a Pegasus rocket slung under a L-1011 “Stargazer” aircraft flying at 39,000 feet above the Kwajalein Atoll in the western Pacific. The rocket fell for five seconds before igniting and boosting the telescope into orbit where it successfully deployed. 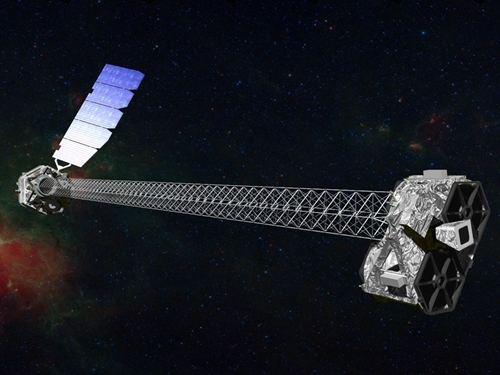 "NuSTAR spread its solar panels to charge the spacecraft battery and then reported back to Earth of its good health," said Yunjin Kim, the mission's project manager at NASA's Jet Propulsion Laboratory in a statement. "We are checking out the spacecraft now and are excited to tune into the high-energy X-ray sky." The telescope is designed to examine the higher-energy X-Ray emissions from near the heart of black holes to understand how light and matter behaves in such extreme environments. NuSTAR will also look at the relatively early remains of supernova explosions – indeed NASA said it was hoping for a new supernova nearby and could have the telescope reorientated within hours if one occurred. It is 100 times more sensitive than NASA's Chandra and the European Space Agency's XMM-Newton high-energy X-ray telescopes, and it will make images that are 10 times sharper. Chandra and XMM-Newton can detect X-rays up to 10,000 electron volts (eV); NuSTAR can catch them at up to 78,000 eV. NuSTAR's lighter design also enabled the air launch, which frees the operators from the expensive business of pushing a rocket (and the fuel it needs) through the initial stages of the earth's atmosphere. It also allowed the satellite to be launched as close as possible to the equator to minimize the effects of the Earth's magnetosphere on NuSTAR's delicate instruments.